I looked up childhood, Such as the night sky in the summer camping, deep blue ... Luxury 1 laps natural stone lapis lazuli. One grain carefully in gold wire we have hand-rolled finish. So that your stone shine, use only lapis lazuli As easy We put you in adult women, it was elegantly summarized. Dark blue is your stone of sharp impression in adults, such as the dark blue. 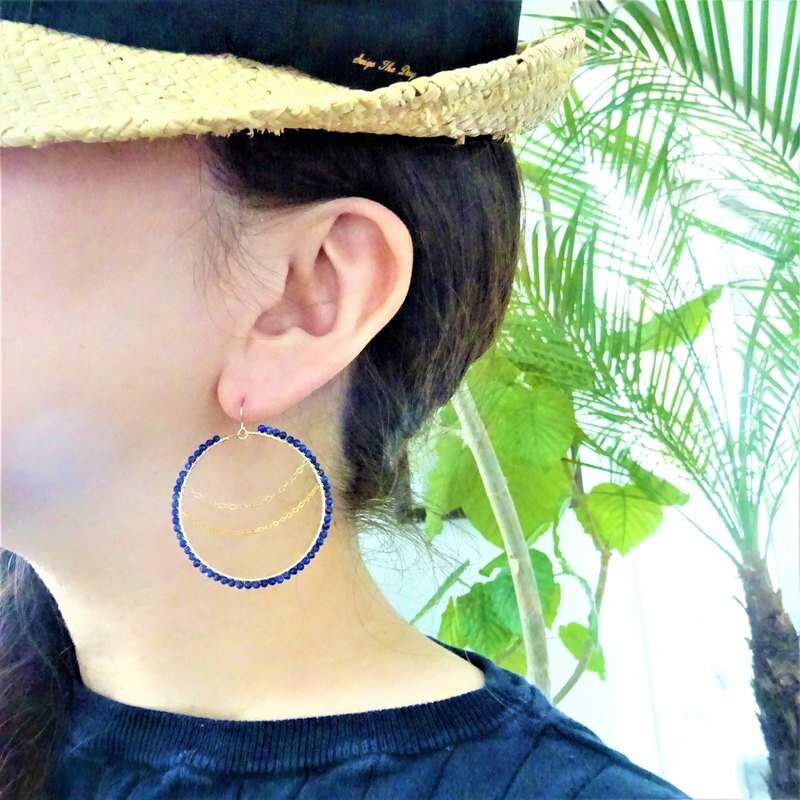 The thin line of hoop earrings, like you are with a Tsubutsubutto stone is lovely, The balance of the time wearing is also good. Light delicate gold wire and sparkling, summer sea and resorts, swaying in the wind even in everyday use, I think that you can use it to cool. Natural stone / lapis lazuli (minimum 2mm ball) Pierce hook / 14kgf 14 Kimutsutsumikin Size / hoop diameter of about 40mm Pierce hook included total length of about 50mm At a campsite in summer. Dark blue like the night sky honored around a child ... A natural stone lapis lazuli was wound 1 round luxuriously. Each 1 drop was extorted by hand by gold wire politely. A stone stand out, only azure stone, envoy It has been completed elegantly so that an adult lady may tend to put on. The dark blue like being navy is a sharp impression for this stone. The state with the grain and the stone seems pretty in a hoop pierced earring of a thin line. The balance when putting on, is also good. After I shake in a wind when usually using a sea and a resort. I think it can be used by a cool impression. Natural stone / lapis lazuli (very small 2mm Marutama) The size / about 40 mm of hoop diameter About 50 mm of full length including the pierced earring hook ※ The respective sizes are an aim. ※ The atmosphere of the color depends on the environment of the monitor that you use it, and it's sometimes seen. ※ When it's pulled hard for a handicraft, it breaks. Attentively, please handle it gently. ※ The difference in shipping charge is made the price of the packing material. Please understand. A producing center / production method A producing center: Japan Handmade.